In 1989 I had visited Dingle several times to swim with the dolphin and had decided that the opportunity to swim daily with a wild dolphin was too good to miss. Just as soon as I could sell my house at the end of that year and wind up my affairs in England, I moved to Dingle. To earn a living, I conceived the idea of hiring out wet-suits and snorkelling equipment so that other visitors could also swim with the dolphin, and so, to cut a long story short, on St. Patrick’s Day 1990, ‘Seventh Wave’ opened for business on Dingle pier. It is hard to remember now that in those days, the whole idea of year-round swimming in the sea was a novelty in Dingle. 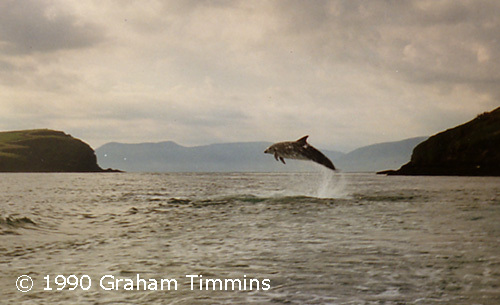 At the height of summer, a few holidaymakers and locals would take a quick plunge off the tiny beaches at Sláidín or Beenbawn, and some had briefly encountered the dolphin in this way. But the vast majority of dolphin-human encounters had been with divers, for the simple reason that they were the only ones who had wet-suits. There were no surfers in Dingle at that time, nowhere to hire or buy any gear anywhere nearby, and even if you were prepared to drive to Cork or further in search of a dive shop, the prices and limited range available would have put off all but the most determined. Those of us non-divers who were hooked on the idea of swimming with a wild dolphin, and who had travelled from other parts of Ireland and from England to accomplish this, had mostly borrowed an often ill-fitting assortment of wetsuits, masks and snorkels – with boots and fins if we were lucky – from diver friends. 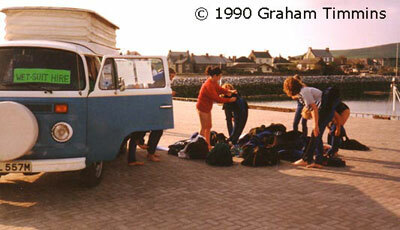 Once sold on the concept, we tended to buy our own gear back home ready for our next trip to Dingle. But for the average tourist or holidaymaker arriving in Dingle, or even someone prepared to plan a trip specially to meet the dolphin but unable or unwilling to fork out an extra couple of hundred pounds for diving gear they might never use again, there were no practical options as regards swimming with the dolphin on any kind of sustained basis. It was into this gap, armed with equal measures of ignorance and bravado, that I drove my old VW camper van, filled to the roof with wetsuits, masks, snorkels, boots and fins. Ignoring advice from dive shops that I only needed two sizes of wetsuits, Large Men’s and Medium Large Men’s, I had ordered every size and shape I could lay my hands on, from kids sizes to XXL, with accessories to match, as I knew already that the dolphin wouldn’t discriminate between people based on size, gender, age or any other factor. With the benefit of hindsight and after dozens of TV programmes about people swimming with dolphins all over the world over the last 10 years, it doesn’t seem so surprising now that my hunch was soon proved to be correct. However, at the time, it was more than a novelty, it was positively eccentric to want to swim with a dolphin. Even in Dingle itself, although many local residents had seen the dolphin’s brief appearances on TV, only a handful had been out to see him in the flesh, and only the few sub-aqua enthusiasts had seen him face to face. Boat trips were just starting, on a very ad hoc basis, but they didn’t have many takers. The word was only just getting out. When I arrived down at the pier on a wet and windy Saturday in March 1990 with my camper van and hand-written ‘Swim with the dolphin’ sign, the fishermen and the first dolphin boat operators alike clearly thought I was plain crazy, and several told me so. However, it wasn’t long before the boatmen were happy to see me there, as they found I was bringing them customers: people who might not otherwise have taken a boat trip were doing so just because there was the chance to swim with the dolphin, instead of merely watching him from up on deck. They may not have shared or understood the visitors’ enthusiasm for hopping in the water at the sight of an approaching fin, but they certainly understood the commercial potential, and for a while at least, we all existed in a mutually satisfactory relationship. For the first time ever in Ireland, people other than sub-aqua divers now had the chance to swim with a wild dolphin in safety and reasonable comfort. Due to my personal contacts and the growing network of friendships which formed through people meeting at Seventh Wave, it wasn’t long before individuals and groups were planning holidays specifically to swim with the dolphin, coming mainly from the UK but later from all over Europe and even further afield. To my surprise I was soon earning a modest living as well as getting to swim with the dolphin every day. None of this had a negative impact on the dolphin, I don’t believe, as at any one time on a particular day there were still only a handful of people going out swimming. The boat trips were getting busier all the time throughout this year, but most days they still left us plenty of time and space to interact with the dolphin at our leisure. The other development which was new in 1990 was the involvement of the international media, and for this I also have to bear my share of responsibility. When journalists and film producers started ringing me up and asking me to do interviews or help with their programmes, in my naivety I saw it as a great opportunity to get my own messages across: dolphins are amazing, intelligent animals, we should do something about the killing of cetaceans going on all over the world, we should stop polluting their environment, that sort of thing. It didn’t always work out like that, but that was the idea at least. Thus in the course of 1990, I was involved in a number of programmes made for UK TV, at least one of which was shown to an initial audience of 11 million and later repeated. I was also interviewed for German, French, Dutch, American and Australian TV networks, though I don’t know what became of most of that footage. Seventh Wave also featured in several articles in the national press in the UK including a large (albeit cynical!) colour supplement feature for a major Sunday paper. It took me a while to realise that my ‘save the dolphins’ agenda only figured in the calculations for as long as it took the reporter or producer to get my co-operation, and I never got used to the depths of cynicism and lack of interest in the truth which I encountered with the media. Nevertheless, the result of all this publicity was naturally an increase in visitors travelling from abroad to see the Dingle dolphin – although surprisingly enough it was still only a minority who wanted to actually swim with him. Meanwhile, back out at the harbour’s mouth, the most conspicuous and regular type of interaction between swimmers and the dolphin at this time was the ‘paddle game’. This game had started with the kayakers such as Mary McGillycuddy mentioned in Fungie History section 1.By 1990 the dolphin was ready for this kind of game with most kayakers and would often ‘perform’ in this way even when uninterested in swimmers. In the spring of 1990 Alfie Hughes and I copied the idea by taking paddles into the water – initially the halves of a two-part kayak paddle – and trying to use similar manoeuvres. We quickly found that the best game was to spin around in a circle with the dolphin and to stroke him along his flank as we turned. The faster we could spin and the more vigorously we could scratch him, the more he seemed to like it. We gradually progressed to shorter and more manoeuvrable paddles with plastic blades. At first we were cautious and worried about hurting the dolphin but it soon became clear that we were not strong or smart enough to do that even if we had wanted to. The dolphin was totally in control of the situation and could easily spin around us just out of paddle range if he chose. Our furious attempts to keep up with him and apparently to stab him with an offensive weapon must have looked truly appalling to bystanders concerned for animal welfare, but on the rare occasions when a lunge actually made hard contact with him, the dolphin only seemed to get more excited, and this would often trigger a serious of vigorous leaps over our heads. Over the next two years much effort was expended on finding or adapting the perfect paddle: long enough to give the dolphin his space but short enough to flick rapidly through the water, strong but light, etc. At times the dolphin really seemed to be attracted to a particular colour or style or texture of blade and everyone wanted a go with the ‘magic paddle’ of the week. A paddle was as much a part of a dolphin snorkeller’s kit as a mask or fins at that time, but in the long run he got bored with all forms of the game and it largely fell into disuse after 1995. Even after this stage, though, the dolphin continued to allow or invite scratches from a kayak or boat paddle, particularly when wielded from small boats. Any kind of stimulating interaction with the dolphin could lead to a bout of jumping on his part. He could also start jumping entirely for his own reasons without any apparent cause or provocation. This has in fact always been one of the Dingle dolphin’s fortes and remains so to this day. He jumps higher, more energetically and more precisely than any other interactive dolphin we know of, despite his now advancing years. It might be a single high graceful arc out in the harbour’s mouth, a sideways or backwards flop around an object towed behind a boat, or repeated leaps over and over, apparently without any time to regain momentum underwater, such as he would often perform when attempting to attract back a departing speedboat. Sometimes he would come up steeply by the side of a trawler or dolphin boat, as if to look inside the wheel-house 4m over the water’s surface, at other times he would perform a frantic series of low racing leaps on his own in the channel, maybe after a successful fishing bout. In the early days he apparently would jump clear over small boats, and into the early 90’s he was known at least to leap over the sterns of such vessels, though in recent years such exuberance has been confined to certain favoured sailing dinghies and windsurfers. Most impressive and exciting of all, though, to those of us who have swum with the dolphin, is when he actually jumps right over you in the water. At times he will emerge almost vertically, brushing past you as he rockets into the air, turn and curve right over your head as you hang frozen with shock and excitement in the water and then plummet back again on the other side of you, so close that if you had enough time and quick enough reactions to attempt to move, you would be crushed by a third of a tonne of solid dolphin. From underwater you can see that he does not take a long run-up to achieve this and in fact once moving it requires only a single flick of his tail to accelerate him fast enough to leave the water! When the dolphin seemed not to be particularly interested in playing, it was often possible to attract him by using various tricks such as banging stones together (at least, many people believed this, although we never witnessed a totally conclusive demonstration) or rattling an anchor chain. I used to go out to the dolphin in my small inflatable boat and anchor up off the beach, so this was a handy accessory to have. The anchor chain seemed to hold the dolphin spellbound; he would hang 50cm from your face as you rattled it, twitching his head one way and the other like a dog trying to pinpoint a sound source. Half a dozen people could gather round to get a great view of him while he was mesmerised like this, provided they didn’t try to get too close. If one person reached out to try and touch him, he would be off with a flick of his tail. The anchor chain trick worked for a couple of years (though we tried not to use it too often) until suddenly the dolphin lost interest and that was it. 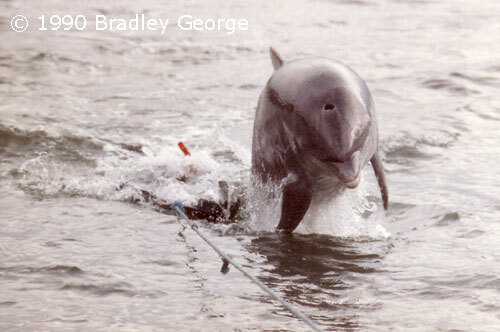 Through 1990 and 1991 we tried many other objects to engage the dolphin’s attention and hopefully offer him some entertainment: floats of various kinds, footballs, a trumpet, umbrellas (really! ), wind-up clockwork dolphins (small ones! ), lilos, rattles etc. All of them worked for a while but not for long. The most attractive toys were always objects towed behind boats: kayaks, surf-boards, lifebelts, blow-up plastic whales and even empty barrels. The dolphin tended to swim alongside these things, so if you were in or on them you got much closer to him for much longer than normally. Best of all the towed devices was a hydroplane which enabled the snorkeller to submerge himself alongside the dolphin. However, we tried to limit the use of these devices as much as possible, for a number of reasons. Firstly they were antisocial when there were other people around hoping to catch a sight of the dolphin, because when they worked you were inevitable drawing him away from the beach. So we only used the tricks when we could include everyone in taking turns, and/or when he was otherwise not interested in coming near anybody. Secondly they involved the use of a motor boat which is by definition antisocial in that environment. Thirdly they were basically cheating and did not give the same satisfaction as when the dolphin chose to interact without the draw of a new toy. And finally we didn’t want the dolphin to get accustomed too quickly and so get bored, so we tried to save the best tricks as long as possible to preserve their shelf life. Nevertheless they all fell by the wayside soon enough. These years were the period of the greatest media interest and many TV crews added to the gadgets on offer, with underwater film and video cameras proving a great draw, and self-propelled ‘Scooby-doo’s a unique thrill for the diver or snorkeller lucky enough to have a go with the dolphin. We had the first jet-skis, every kind of kayak, canoe and surf-ski, and even an amphibious jeep with all four wheels turning as well as a propeller, much to the dolphin’s delight. However, none of this – and certainly not the jet-skis! - can really be said to have contributed much to the evolution of dolphin-human relationships, let alone the raising of consciousness. What Keith and I have always been most interested in are the kinds of interactions it is possible to have one-on-one with a wild dolphin, ideally without any toys at all. 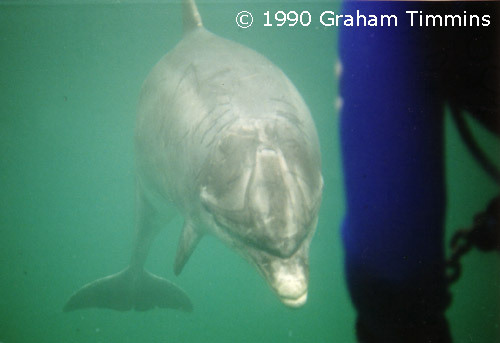 By the spring of 1990 I had decided that it was impossible to discern any patterns in the dolphin’s behaviour. I could not correlate his movements or his playfulness or interest in humans with the weather, winds, temperature, state of the tides or phases of the moon. Various myths common in the press, such as his alleged preference for women, were blatantly fictitious. You could never really tell how he was going to react and who he would pick as his playmate on a particular day – though in general and not surprisingly he did seem to prefer strong and active swimmers, amongst whose number I was lucky enough to count myself in those days. People who just wallowed there in the water tended to be rewarded with a brief swim-past at best, while those over-eager novices who immediately lunged at the dolphin in an attempt to touch or grab hold of him were always given the cold shoulder. Somewhere in the middle seemed to be about right: active, excited, but respectful. I personally found that he was more likely to swim alongside me if I set off purposefully at a tangent when I saw him coming, rather than swimming directly towards him. But it was hard to lay down rules and the dolphin has always loved to be in total control of the situation. I remember on one occasion having a revelation, as I spun around with the dolphin one grey March morning, that we always played this game in a clockwise direction. Ah-ha! I had spotted a pattern! Immediately, as the very thought entered my mind, the dolphin abruptly reversed direction, and proceeded to spin around me in an anti-clockwise direction. This kind of weird synchronicity was always happening to those of us – still only two or three in number – who regularly went out to play with the dolphin. But none of it stood up to independent scrutiny, let alone offering the kind of scientific repeatability which I was hoping to obtain. Meanwhile, several people were planning to make full length movies about the dolphin and I talked to them all about these themes and other dolphin issues close to my heart. 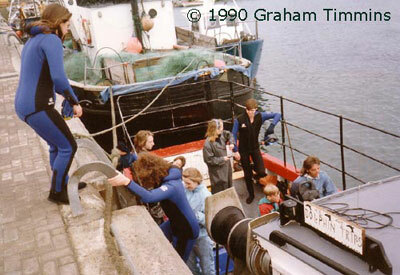 The only really professional team with adequate funding to do the subject justice was London-based Zari Productions, so I ended up giving them the title and working with them on preliminary ideas for ‘The Dolphin’s Gift’, which was eventually filmed entirely on location in October 1990. The way it turned out, I had no input at all into the editorial process, though many of my customers and contacts were filmed and interviewed, and various other unconnected thematic strands came into the narrative along the way. However I still like to think that I had some influence on the general tone of the film, which was respectful of the dolphin as an individual, strongly pro-conservation, and broad-mindedly sympathetic to all shades of dolphin enthusiasm. More to the point perhaps, the film, the first and so far the only feature on the dolphin to be shot on 16mm film stock as opposed to 8mm or video, featured superb photography by one of Ireland’s top film cameramen, Cían de Buitléar, which has never been matched since. With music by Michael Kamen and narration by John Hurt, it was able to achieve respectability in the commercial arena for what was still a fairly risky and unconventional approach, although I didn’t fully appreciate that at the time. Nothing else of a similar standard would be produced until the BBC Natural History Unit returned to Dingle in 1994 (they had already filmed the dolphin in 1989 as part of the ‘Supersense’ series, but it was only a 5 minute sequence that time). This time, under the intelligent and thoughtful direction of Mark Jacobs, they compared the experience of swimming with the Dingle dolphin with the dolphin swim tours in the Bahamas in a film called ‘Dolphin dreaming’. 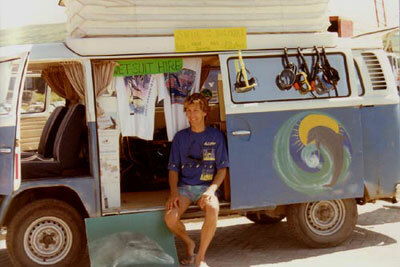 Through 1990 I had been living in a mobile home and operating Seventh Wave from my camper van. In early 1991 I was able to buy an old house with a barn ripe for renovation, where I now planned to open a centre for celebrating dolphin awareness and promoting marine conservation. The project took two years to complete, with the help of many young volunteers from all over Europe who contributed labour or art works in return for free wet-suit hire and trips out to the dolphin. 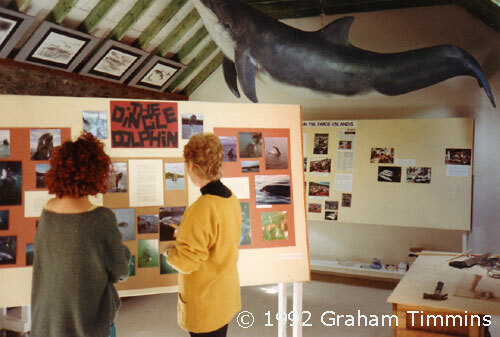 Eventually we had a free exhibition, open to the public, which performed a lot of the functions which this website now does in providing information about the Dingle dolphin and dolphins in general. It also became home to a unique collection of photos and works of art as well as a meeting place for dolphin enthusiasts. Everybody involved with Seventh Wave was rightly proud of the centre, and I met many interesting and talented people from all over the world through working there. Whether we really had any larger impact on raising awareness of dolphin-human interactions or marine conservation issues is uncertain, and not for me to judge. What I do know is that it cost money to open and maintain the centre and it took a lot of time talking to visitors and answering their questions – a role which increasingly fell to my low-paid but much appreciated assistants, Lyndsey Lawrence and Síle Walsh. With their help I was able to provide a much better service to wet-suit customers too, with proper training in the use of masks and snorkels for example, but this was not reflected in business profits. Having established the concept of wet-suit hire in Dingle, I very soon found my cosy monopoly threatened by the advent of a much larger and more powerful competitor in the shape of a local boat-owning family, namely the two Jimmy Flannerys, father and son (no close relation to Tommy Flannery, Tommy ‘Dutch’ Flannery, Martin Flannery or ‘Bruce’ Flannery, all less ambitious dolphin boat operators who were still happy to co-operate with Seventh Wave!). When the J. Flannerys started hiring wetsuits as well as doing dolphin trips, and soon afterwards gained effective control of the newly formed Dingle Boatmen’s Association, all 12 of the boatmen were prevented from collaborating with Seventh Wave and were now obliged to refer any swimming customers only to Flannerys. This was certainly an upsetting development at first, but the way things turned out we would soon have had to stop this way of working anyway, as the increase in boat traffic at that time meant that it was becoming better for everyone to swim off the beach in the early mornings and evenings when the boats were quiet. The only people who really lost out were day trippers from other parts of Kerry or tourists just in town for the day who could no longer get out for a quick swim during the daytime. Nevertheless it was inevitable that my former collaborators would pick up most of the ‘passing trade’ now I was no longer able to hire out from the pier, and I had neither the stomach nor the deep pockets for a competitive commercial struggle. I continued for five years after this to hire out wetsuits to visitors, many of whom started to come off season and for longer periods on my recommendation, so that they could swim every evening and early morning. But the commercial viability declined rapidly after the first two years and by 1995 it was clear that I couldn’t keep Seventh Wave going any longer. Fellow dolphin swimmer John Verling took over the wetsuits when I packed up and kept a smaller hire operation going at Ballintaggart hostel until 1999 but after that there was a monopoly on this business in Dingle. For me personally it was a relief to give the business side up, as I had plenty of other interests to follow, but in terms of public information and communication about dolphins I feel that the resultant closure of the exhibition centre was a greatloss, one which has only begun to be remedied since 2001 with the introduction of this website. Meanwhile out in the harbour, parallel changes were taking place in dolphin-human interactions as well. 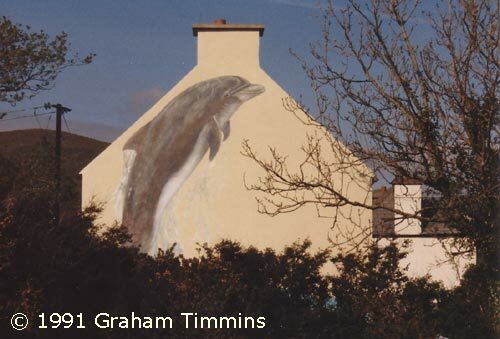 Throughout the dolphin’s residence in Dingle, there have always been people who the dolphin has ‘taken to’ more or less instantly. Others have had to work hard and persevere over many weeks or months before suddenly one day the dolphin would start to take an interest in them. Sometimes this has resulted in the development of something which could be called a relationship, although on other occasions an initial apparent intimacy was not repeated on later visits. As a general rule, though, at least by the 1990’s, it tended to take time and patience before the dolphin really accepted someone. 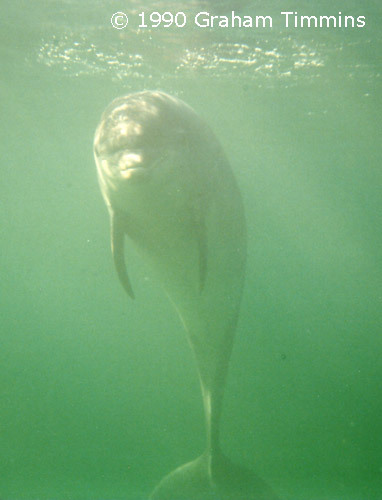 During most periods of the dolphin’s residence there has been a small group of regular swimmers who the dolphin has accepted as his favourite playmates. I was lucky enough to be part of that band through the 1990 and 1991 seasons. The existence of an ‘inner circle’ has never excluded strong interactions with occasional swimmers or other visitors, but not surprisingly it has been those who have put in the time and effort who have over the years enjoyed the richest and most complex interactions with the dolphin. The members of the ‘inner circle’ have shifted over a period of time, and even the most dedicated swimmers could find themselves unexpectedly out of favour from one day to the next. They could also be reinstated several months later, or perhaps not at all. This, in brief, was what happened to me. Through the 1992 season the dolphin only played with me sporadically, whilst others moved into the hot seat. I saw other people fall in and out of favour during this period as well, though I don’t think it affected anyone who had enjoyed quite such an intensive relationship with him as I had. I continued to go out to the beach most days through 1993, and I found that the dolphin would usually play with me in my kayak, even if not in the water. 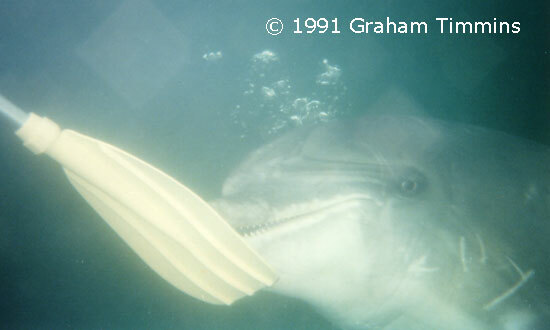 After a while that stopped too, and by 1994 the dolphin was ignoring me totally – except that he would still bow-ride my inflatable! Naturally I went out swimming less as I got less response, and I devoted more of my time and energy to running Seventh Wave and other activities. But I had seen the dolphin return to playing with people he had blanked for several months, so I would check it out every now and again to see if I might have returned to favour. In fact I am still checking it out, though only once or twice a year these days! Meanwhile of course there were plenty of great swimmers keen to take up the baton. 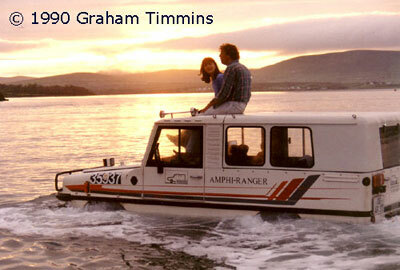 Keith was rarely out of the water during 1992 and later that year Jamie Crane and John Verling arrived in Dingle. They were to become the main men around the dolphin over the following three years, and Jamie in particular wih his trademark dreadlocks sticking out of the back of his hood and his modest and gentle style with the dolphin will be remembered by anyone who swam or watched at Sláidin during that period. The chief result in Dingle of the media hype which started around 1990 seems to have been to increase the interest in boat-based sightseeing, rather than in swimming with the dolphin or interacting with him on his own terms. Swimming peaked around 1992 or 1993, despite continually increasing visitor numbers, whereas boat trips continued to go from strength to strength. At this time there would be about 10 -15 visitors swimming on a nice summer’s evening and two or three ‘regulars’, often with 20 or 30 spectators who would come down to the beach to watch the show after the dolphin boats finished for the evening. The dolphin didn’t seem to mind if there were twenty in the water; usually he would have a quick look at everybody but concentrate nearly all his attention on the people he already knew and liked to play with. The visitors were primed, if Seventh Wave customers, not to be too eager, and so they usually got great views of the dolphin playing with his familiars without interrupting the game. Sometimes people would crowd in too much and spoil it for everyone, but only when it was really busy, and even then it didn’t affect the dolphin himself. Sadly the quality of the experience on offer from the booming dolphin boat industry seemed to remain low as they got busier. Although the number of commercial licences available was kept to 12, there were no limits on how large the boats could be, and these rapidly grew to 40-seaters and even a 72-seater. There were also no restrictions on how many of the boats could be out at any one time, nor on the hours of the day when they could operate – unbelievably this remains the case at the time of writing (2002). After a few people fell overboard from the early dolphin boats (luckily none were injured), regulations as regards passenger safety were tightened up and the boats had to start carrying lifejackets, but there have never been any regulations to protect the dolphin, a globally unique situation as regards dolphin tourism. Although most of the commercial boat operators have a distant respect for the dolphin gained from years of following him around the bay, I would not be alone in having always felt that they could make a lot more effort to place the dolphin in the context of other dolphins and the conservation of the marine environment, and to provide some educational input into the boat trips. Numerous marine conservation groups including the IWDG and the Marine Connection have called for this and offered to help, but to no avail. In 2002 there are still no requirements to use low emission marine engines within the harbour or to fit propeller guards such are used by other cetacean watching operators. In fact this is probably the least regulated cetacean watching operation anywhere in the world. Of course, lots of day trippers have had a ball and no-one could knock the pleasure of seeing the dolphin when he was on good form and leaping around the boats. The problem was that commercial pressures became dominant, and Dingle became notorious for the ‘dolphin circus’ whereby an unlimited number of boats – often 20 or more on a nice summer’s day – would be chasing around after one lone dolphin and powering down on him every time he came up to breathe, whether or not he was interested in ‘performing’ for them. At the least this looks greedy, and even if the dolphin can cope with it - and it must be admitted that he does seem able to thrive on being hunted - it does not provide a good experience for the punters. Other Irish dolphin watchers have learnt from the mistakes of Dingle and have been very careful to distance themselves from the model which has been adopted here. 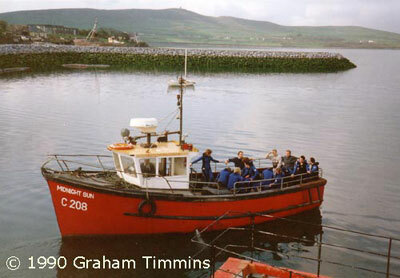 For example in the Shannon estuary, boat operators have agreed clear guidelines about not pursuing the dolphins there and not having too many boats out at one time (Link to "Saoirse na Sionna" Shannon dolphin boat operators' accreditation scheme), while in Doolin and Fanore, when the friendly dolphin ‘Dusty’ appeared in 2000 and 2001, a main concern of locals was that these places should not become ‘another Dingle’. Whatever other effects the dominance of the boat-based dolphin-watching industry in Dingle was to have, one result was to make it ever harder to find the time and space to interact with the dolphin in any other way. Swimmers were increasingly squeezed into the very early mornings and late evenings, when they still had to compete with numerous private boats, some of whom were as unhelpful as the dolphin boats in the way they would draw the dolphin away from the beach and try to keep him all to themselves. 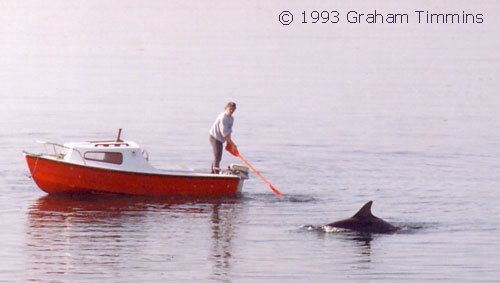 Flannerys also started their own early morning swimming trips, usually with about 10-15 takers on board and bringing with them a ‘catcher boat’ to round up the dolphin whenever he lost interest. At the same time, the dolphin had perhaps been over-hyped in the media and people had come with too high expectations which had then been disappointed. By the time I closed Seventh Wave down after the 1995 season, fewer tourists and summer visitors were coming to Dingle to swim with the dolphin. Nevertheless, quite a few other people had settled in Dingle during this period specifically on account of the dolphin. Most of us came on holiday or on extended visits several times before moving here. Some were to stay for a few years and others to remain on to this day. Alongside Jamie and Johnny V, Trevor Read, ‘Dublin’ John Hawkins and Rachel Sharpe (‘Tex’) were some of the most regular swimmers in 1993, whilst Jason was one of the few winter swimmers in the 1994 season. At this time there was a real community of dolphin fans who would meet up at the beach most fine evenings either to swim or just to hang out. From 1994 however, summer swimming fizzled out altogether due to the pressure from the boats. A new phase began now, with the remaining swimmers concentrating on the back end of the season from September through to Christmas. Most of the key swimmers in this period were men, until Judy came along in 1995. Jamie was to maintain a unique position for many years, and although he has not been swimming regularly since 1996, he never really fell out of favour. Jamie developed two contrasting specialities: deep-diving, vigorous paddle games and shallow water meetings. When given space to do so, the dolphin would often come into very shallow water off the beach to greet Jamie, sometimes still only knee-deep in the water, which was remarkable to watch with this normally very cautious dolphin. Keith would tend to stand out for bursts of very fast, active swimming and diving. John Verling on the other hand had a more leisurely style, so an observer could tell at a distance from the dolphin’s movements who was playing with him, before the swimmer himself was discernible. Some of the enthusiasts mentioned above gave up swimming after a lean patch, as I had done, and others simply got more involved in other aspects of life and didn’t want to devote the necessary time and energy to trekking down the beach every day. Some moved away from Dingle. John wasn’t swimming much after 1995 and Keith had also dropped out for a while by this stage. But Jamie wasn’t left on his own for long, as fresh blood had arrived in the shape of Nick Massett and then Suzanne Murtagh and Jenny Tsagalas. The dolphin story for them was only just beginning. Anything to add to this account or to correct from your own personal knowledge? Mail the editor (Graham Timmins) here!